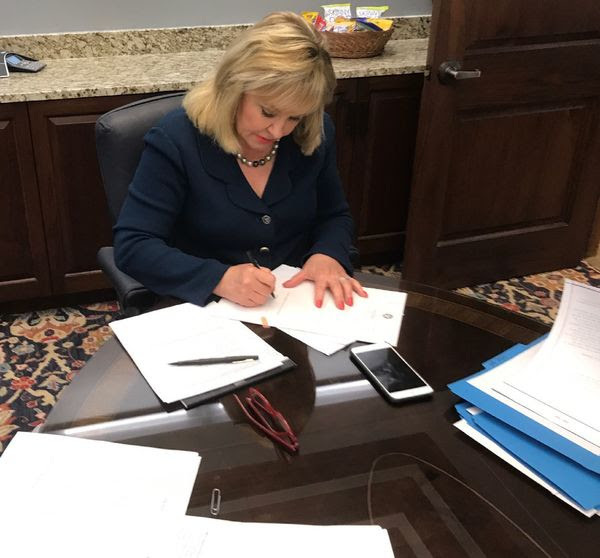 Caption (provided): Governor Mary Fallin signs House Bill 3705, the $2.9 billion appropriation bill for common education for the upcoming 2019 fiscal year. The amount authorized in the measure is a 19.7 percent increase over the $2.4 billion appropriation bill for K-12 public education for the current fiscal year. OKLAHOMA CITY – Governor Mary Fallin today signed the $2.9 billion appropriation bill for common education for the upcoming 2019 fiscal year. The funding authorized in House Bill (HB) 3705 marks a 19.7 percent increase over the $2.4 billion appropriation bill for K-12 public education for the current fiscal year, which ends June 30. This is only the second time that legislators approved an appropriation bill for public schools by the required April 1 education funding deadline since 2003 when the requirement was put in place. “I’m pleased to sign this bill that provides a significant increase in spending for our public school system,” said Fallin. “I’m hoping this additional funding will result in improved K-12 public school results. Our job as a state is to empower our students, parents and teachers to succeed by setting the bar high and challenging each other to succeed. The $2.9 billion funding contained in HB 3705 includes $353.5 million for teacher pay; $52 million for support personnel pay: $33 million for textbooks: $17 million for the state aid formula; and $24.7 million for flex health care benefits. The total increase in common education funding for the 2019 fiscal year is $480.2 million. Fallin also signed HB 1026XX, which provides a $1,250 annual increase in pay for school support personnel. In addition, the governor signed HB 1024XX, which provides a tiered pay raise for state employees. State workers earning $40,000 or less would get a $2,000 raise; those being paid $40,000 to $50,000 would get a $1,500 raise. Meanwhile, those making $50,000 - $60,000 would get a $1,000 raise and those earning $60,000 or more would get a $750 raise. All three measures take effect July 1, the start of the state’s 2019 fiscal year.